Welcome to Campooz. Drive to the horizon and go on an adventure. Enjoy the convenience, comfort and quality! We are a young Dutch tent trailer brand. Camping is our passion. Introducing Fat Freddy, Lazy Jack, Lola, Ugly Betty and Wild Anna. 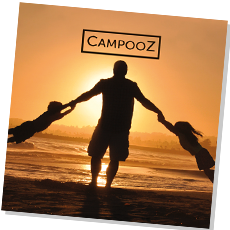 New in 2019 – The Campooz Camping System! From two to six – and back again. Nice and flexible! Tent trailers that change with each family situation. Without children, with (bonus) children, children separately, or as guests of the grandparents. The combinations are endless! The Clima-C System ensures a comfortable temperature during hot days and nights. Campooz is the only brand with a convertible roof. Through this, warm air will easily find its way out. The convertible roof is fitted with dark and thermally insulated mesh screens. The side wings form a barrier against warm sun rays. A wrench 13 is all you need to disconnect the tent from the trailer. This makes Campooz a truly unique concept! You can store the tent on its side in your garage, while you use the trailer all year long. Why a wrench 13? The first introduction of the three Campooz men took place during the Wrench 13 Rally, organised by Gert and Raoul. Harry went along with a car full of spare parts. The rally was driven from Romania to the Netherlands in old Dacia’s. The only thing that is needed to repair these cars is a wrench 13.